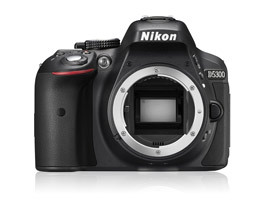 Nikon’s consumer grade models follow a fairly consistent annual upgrade with the upper entry-level D5300 introduced almost exactly 12-months after the D5200. Along with a few external design changes, including a new larger 3.2-inch articulated display panel and some upgrades to the video spec, the new model is the first to feature built-in WiFi and GPS. However, it retains the same shutter and focus modules of the earlier D5200, including the 39-point Multi-Cam 4800DX AF module and 2016-pixel RGB metering sensor. Both the AF module and RGB meter were the same units used by the earlier 16-Mpix Nikon D7000. Like the previous D5200 model that’s built around a 24-Mpix APS-C CMOS sensor, the updated D5300 uses a related sensor with the same pixel count but sees the AA filter removed. Without the blur filter in place, the D5300 promises an increase in both sharpness and contrast, though that will ultimately depend on the quality of the lens in use. 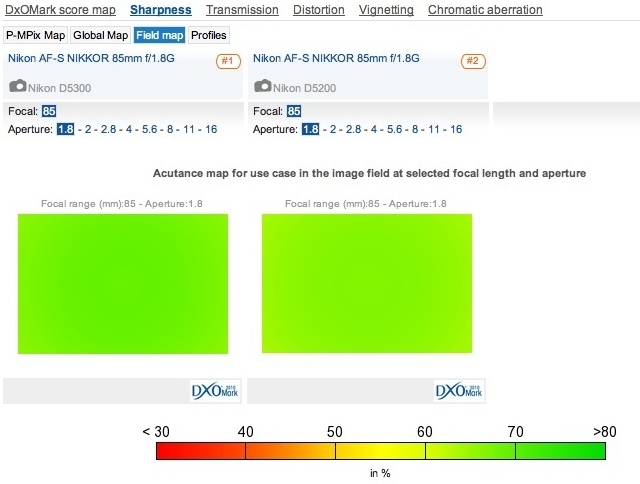 Our labs have carefully analyzed the optical performance of over 140 models on the Nikon D5300, from both Nikon and third-party makers, ranging from the ultra-wide DX format Sigma 8-16mm (12-24mm equivalent) f4.5-5.6 DC HSM and Nikon AF-S Nikkor 10-24mm f3.5-4.5G ED through to the popular Sigma 50-150mm f/2.8 EX DC APO OS HSM and full frame Nikon AF-S NIKKOR 80-400mm f/4.5-5.6G ED VR. New models assessed include the new high-speed Sigma 18-35mm f1.8 DC HSM A and full-frame Nikon AF-S Nikkor 80-400mm f4.5-5.6G ED VR, as well as the recently revamped Nikon AF-S Nikkor 18-140mm f3.5-5.6G ED VR – the official kit lens to the Nikon D5300. We’ve also added the data from the new full-frame ultra-high end Zeiss Otus Distagon T* 1,4/55 as well as the upgraded Sigma 30mm f1.4 DC HSM, and Nikon’s new fast standard AF-S Nikkor 58mm f1.4G. In North America and Europe, the Nikon D5300 is available with the new recently upgraded 18-140mm f3.5-5.6G ED VR, a zoom with a decent range if rather modest variable aperture. However, it’s stabilized and a pretty good performer – with slightly better performance on the D5300 at the longer end of the zoom range than the equivalent Canon EF-S 18-135mm f3.5-5.5 IS STM on the 20-Mpix Canon EOS 70D. 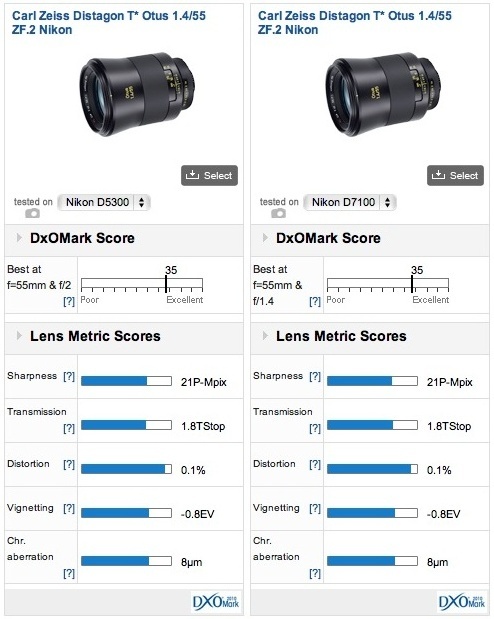 The Nikon D5300 and Nikkor lens combination also achieves higher peak sharpness score of 11P-Mpix versus 9P-Mpix than the Canon pairing, though it’s impossible to say with any certainty if the Canon lens would be able to achieve similar sharpness with a yet to be released higher resolution camera, though it may well do. Performance falls throughout the zoom range of both the Nikon 18-140mm and Canon 18-135mm zoom lenses, though the Nikon combination is sharper at the longer end of the zoom range and has the higher peak sharpness overall. Externally the D5300 differs from its predecessor by a slightly re-modeled exterior and a new larger 3.2-inch side-articulated display panel. There hasn’t been a lot of change internally either with some upgrades to the video capabilities (the addition of 1080/60p), however, the new model is the first to feature built-in WiFi and GPS. Previously, these were additional add-ons, and quite expensive options. The most significant modification, at least with regard to a potential increase in image quality is the removal of the AA filter. Sensor performance between the two models is practically identical, but the removal of the AA filter promises a substantial improvement in resolution and contrast. 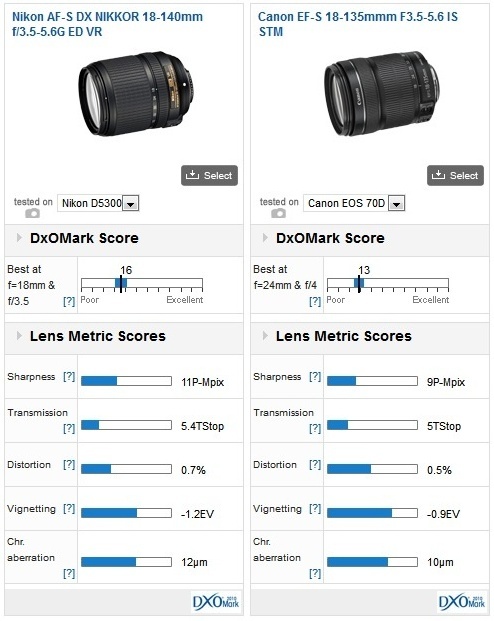 When we compared the improvement in sharpness between the 24-Mpix D5200 and D7100 we noted an increase of up to 18% was possible using some of the best performing lenses. 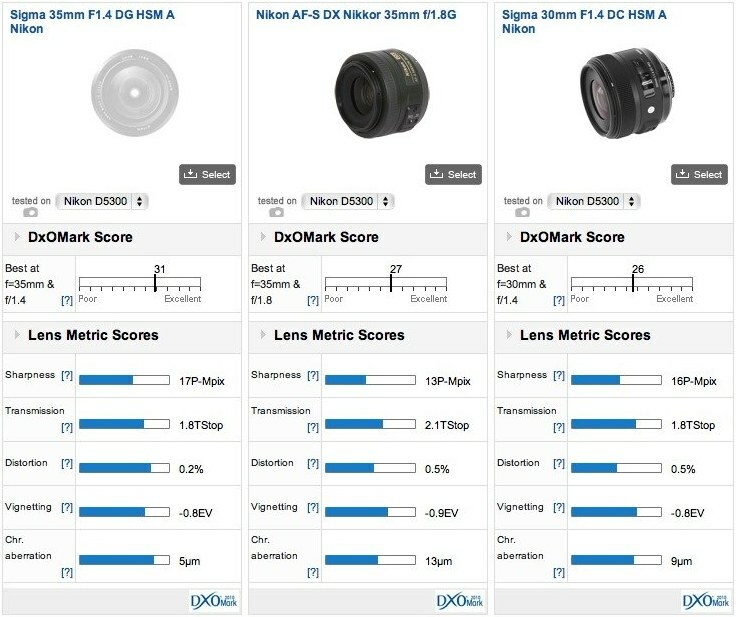 With the D5300 supposedly sharing the same sensor construction (sans AA filter) as the D7100, we were curious to see just how well the lenses perform on both those models and on the earlier Nikon D5200. Comparing one of the best performing models on both the Nikon D5300 and D5200, the AF-S Nikkor 85mm f1.8G, there’s a significant increase of just over 20% in peak sharpness between the two. However, as you might hope, the increase in sharpness isn’t restricted to the optimum aperture. 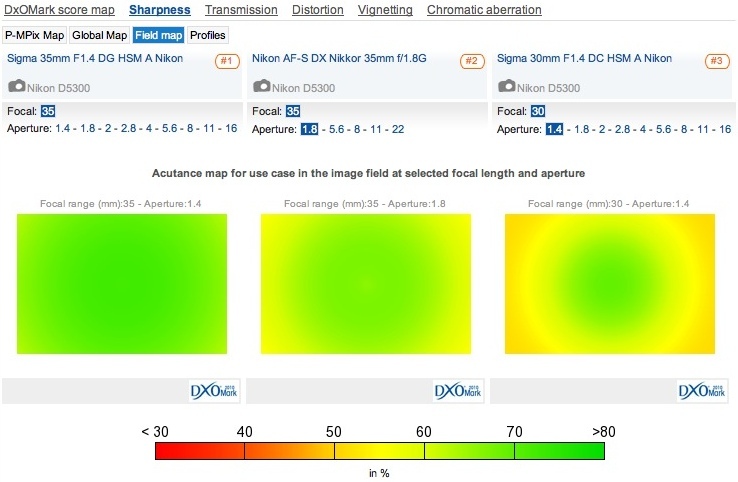 We measured an increase in sharpness throughout the aperture range. 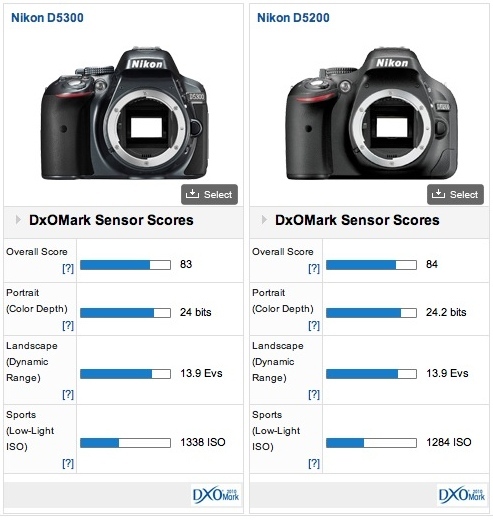 With the AA filter removed the Nikon D5300 achieves a measurable increase in sharpness over the earlier Nikon D5200, despite both cameras having the same pixel count. We also tested the Nikon D5300 against the Nikon D7100. Both cameras feature 24-Mpix APS-C CMOS sensors without an AA filter, and, as you might expect, both deliver similar levels of sharpness for a given lens model. When we tested the same Nikon AF-S Nikkor 85mm f1.8G lens on the two cameras, the D5300 delivered similar, though not quite identical, results to the D7100. There was a slight increase in peak sharpness of just over 1.5P-Mpix (though the graphs show 2P-Mpix, the sharpness score is rounded – in this instance one up, one down). However, don’t expect to see this advantage recurring throughout the different lens models. 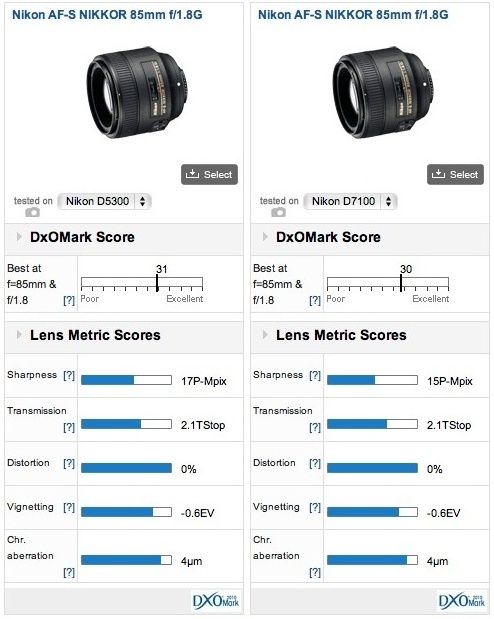 Further comparisons with high performing lens models resulted in similar peak sharpness levels, signifying the two cameras are very close in image quality. At just under $4,000 it will come as no real surprise to learn that the Zeiss Distagon T* Otus 1,4/55 (55mm f1.4) ZF.2 is the best performing prime lens on the new D5300. 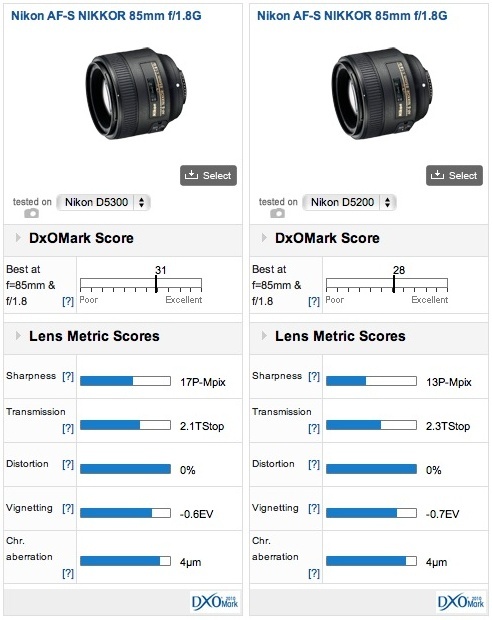 With a DxOMark score of 35 points, it’s the best-corrected lens we’ve seen. While other lenses move up or down in the ratings between APS-C and full-frame cameras, the impressive uniformity of the Zeiss Otus 1,4/55 maintains its position at the top of the rankings. It’s also the sharpest lens with a peak sharpness score of 21P-Mpix, up to 3P-Mpix (effectively just over 16%) more than the next best lens. In joint second place is the full-frame Nikon AF-S Nikkor 85mm f1.8G and Sigma f1.4 DG HSM A both good value and relatively accessibly priced lenses. However, if you’re specifically looking for a 35mm to use solely on the D5300 or other DX format Nikon bodies, we would recommend looking at the dedicated AF-S Nikkor 35mm f1.8G. It’s a good deal smaller and lighter than the full-frame Sigma and while not as fast it’s just less than a fifth of the price at $195, and yet has very good image quality. Equivalent to a 46mm on the D5300, Sigma also offers the 30mm f1.4 DC HSM A model, which is the new upgraded version of the highly regarded 30mm f1.4 EX DC. It is faster and sharper than the more modest AF-S Nikkor 35mm f1.8 but it sells for about twice the price at $499. Although peak sharpness is lower than the two Sigma models the Nikkor lens has a pretty good uniformity. Although we’ve yet to see Nikon respond, Sigma’s new 18-35mm f1.8 DC HSM A was a disruptive influence in the market, and for very good reason. Not only is it the fastest zoom available for DX format models it’s also one of the best performers. In fact, of the models tested on the D5300 it’s the best corrected. Peak sharpness is 18-P-Mpix on the D5300 and an excellent performance for an ultra high-speed model. 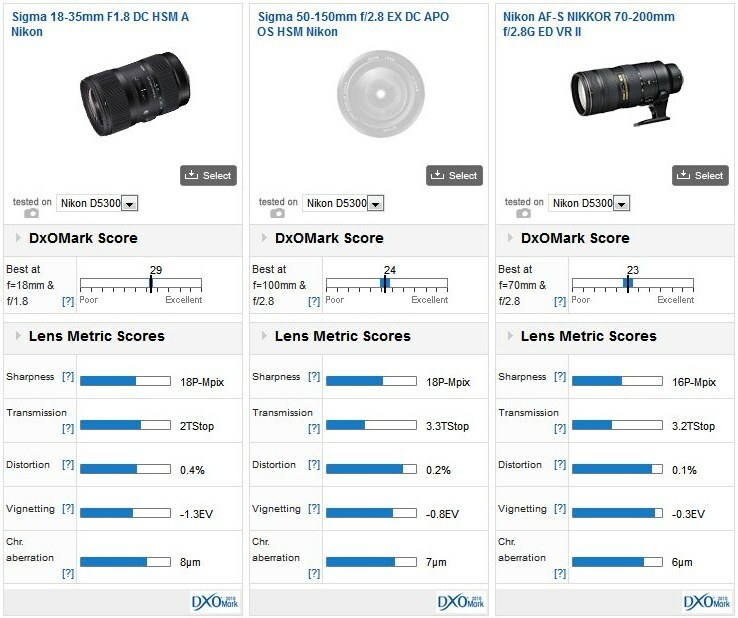 Sigma also features in second place with the highly regarded DX format only 50-150mm f2.8 EX DC Apo OS HSM achieving a DxOMark score of 24 points, and the same peak 18P-Mpix sharpness as the 18-35mm. It’s quite possible to just buy these two lenses for the D5300 and cover 95% of what general-purpose photography requires. In third place is Nikon’s AF-S Nikkor 70-200mm f2.8G ED VR II, the full-frame equivalent to the previously mentioned Sigma 50-150mm f2.8. Although it’s a great performer you’ve really got to need the focal length range as it’s big and heavy. It’s also not cheap at $2,699, though as the equivalent to a stabilized 100-300mm f2.8, it’s certainly an attractive enough option. The three top performing zoom models on the D5300, covering focal length range equivalent to 27mm through to 300mm.